How Does Cold Weather Cause Back Pain? Some people claim they know cold weather is coming because they can “feel it” in their bones. There are also some individuals who believe a drop in temperature also worsens their back pain. Does cold weather cause back pain? The short answer is “yes,” because spine-supporting muscles, tendons, and ligaments can tighten when exposed to cooler temps. As for how or why this happens, there’s some debate within the scientific community. Here’s what’s known about the link between cold weather and back pain. Because colder temperatures can cause soft tissues to tighten, added pressure can be placed on nerve roots, which is what can contribute to back pain and related symptoms. Joints around the spine that are already inflamed can also be affected to some extent by a drop in barometric pressure. While there’s some debate about why this happens, several studies have found a very real link between cold weather and back pain. A Swedish study involving construction workers found that people who work outdoors experienced more back pain than those who work indoors. A study conducted in Finland produced similar results. This is the part of the cold weather and back pain debate that’s hotly contested within the scientific community. As far back as the days of ancient Greece, there have been reports of people claiming they can “feel” storms coming, but there are simply no significant studies proving that changes in atmospheric pressure are directly linked to back pain. However, one popular theory suggests back pain may be affected by the decrease in gravity that happens just before a storm or dramatic temperature change occurs. Since there’s less gravity to prevent spine-supporting tissues that are already inflamed to some extent from swelling even more, nearby nerves may become irritated enough to produce a noticeable increase in back pain. There’s plenty of research showing an association between colder, darker days and depression, a phenomenon referred to as seasonal affective disorder (SAD). Seasonal depression may affect the spine and its supporting parts by throwing off natural sleep patterns (circadian rhythm). Less sleep may result in less time for the body’s tissues to naturally heal. Studies have also linked depression to an increase in the production of inflammatory cytokines (proteins), which could contribute to inflammatory diseases that affect spine-supporting tissues. As the weather gets colder, most people naturally gravitate indoors. Sometimes, this means less time being active. A noticeable decrease in regular exercise can, in turn, weaken spine-supporting muscles enough to increase back pain. You may also find yourself enjoying more comfort foods during the fall and winter months. However, if those foods are loaded with unhealthy calories, your spine may not be getting sufficient nutrients, which could result in more back pain. You should also be careful about keeping warm on colder days if you have metal implants in your spine from spinal fusion surgery. Los Angeles residents need to be aware of this—even though it’s warm during the day, nighttime temperatures in Southern California often dip below freezing during the winter months, so people with metal implants aren’t immune to the effects of cold temperatures. The metal parts react differently to temperature, so you may experience an uptick in pain if the area where you had surgery gets too cold. As for what you can do to minimize cold weather back pain, explore your options with indoor activities and exercises. For example, water-based exercises done in a heated pool can work all of the major spine-supporting muscles while also providing therapeutic benefits. 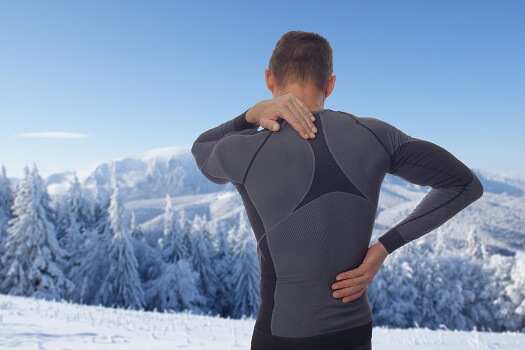 Many people experience back pain or a worsening of spinal pain symptoms during cold weather, and there are several scientifically sound theories that explain why. If you’re experiencing severe back pain, no matter what time of year, see your doctor right away. A Los Angeles spine surgeon can diagnose the source of your pain and get you on the right path to recovery. The spinal health experts at The Spine Institute have a wealth of knowledge about back pain and the least invasive, most innovative methods for treating it. Schedule a consultation with us today by calling 310-828-7757.